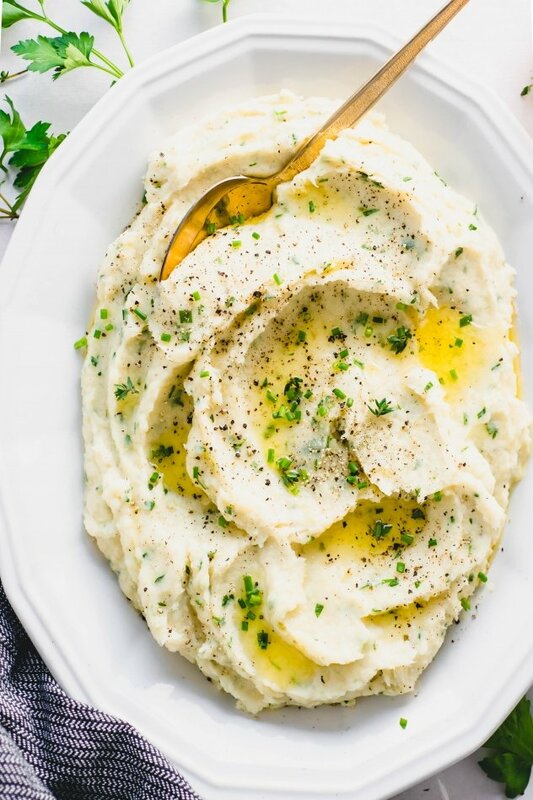 This whipped parsnip with fresh herbs recipe is a delicious alternative to mashed potatoes! A crave worthy seasonal side dish that is perfect for the holidays or as a cozy comfort food side dish. Paleo, gluten free and with a vegan option! It’s here! It’s HERE! The start of epic holiday spreads and all the comfort food dinners while we’re tucked safely inside our homes cozy and WARM. Once November hits it’s game over for me and comfort food. It’s like this gravitational pull that starts between my kitchen and all things warm and delicious and filling. And Thanksgiving always brings that truth to life in the most real way. 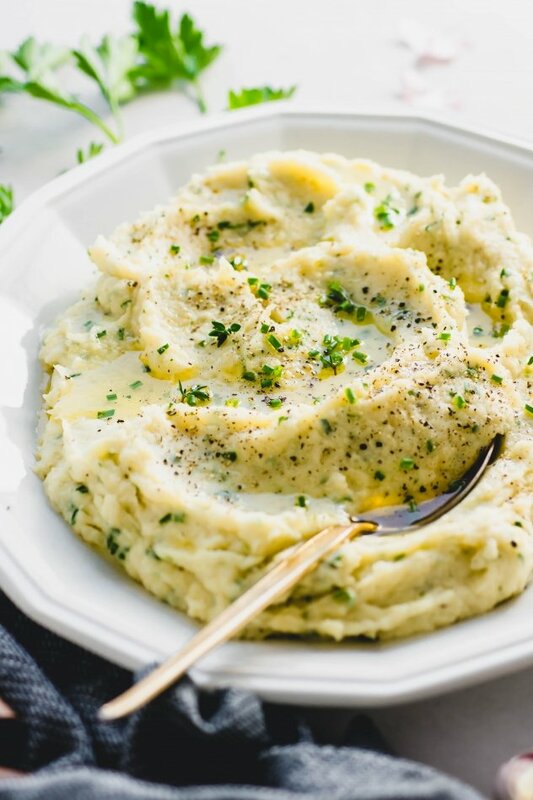 The mashed potatoes, stuffing, green bean casserole, sweet potatoes, etc etc etc, just steal the comfort food spotlight! And since it’s been dropping into the 30’s this week in Seattle, we might as well embrace those vibes by relishing in the warmth of our kitchens and eating all of the coziest foods. STARTING WITH THESE WHIPPED PARSNIPS WITH FRESH HERBS!! This is a recipe that I’ve been somewhat obsessed with for awhiiiiiile. As soon as the weather gets cold I bust it out like we are parsnip farmers and have a whole storage cellar packed with enough parsnips to last us the next 6 months. 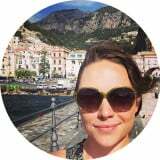 I’m talking braised short ribs with whipped parsnips, caramelized onion smothered pork chops with whipped parsnips, and homemade bolognese sauce with whipped parsnips. Picking up on the theme? They’re yummy enough to be a side dish to just about any every day meal (as I have made it my life long mission prove), but also indulgent enough to grace your thanksgiving or holiday table with style. Not to mention that they are nutrient dense, a low FODMAP food, good for you gut (hiii prebiotics! ), and high in fiber. Crazy delicious and hella healthy = real food goals. First things first you want to peel and cut them into equal sized pieces. Some larger parsnips can have a woody core / interior, so look for small to medium sized ones at the store if you can find them. 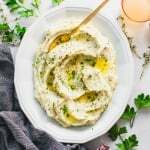 Since you will be whipping the parsnips in a food processor or blender you don’t have to worry about this too much, but if the center seems especially tough you might want to cut it out before roasting. Once the parsnips are peeled and cut you will roast them along with some whole garlic cloves in the oven until soft and just baaaarely starting to caramelize. You don’t really want them to get much color or you will have crunchy edges which can be yummy but are not so great for a soft fluffy parsnip whip. 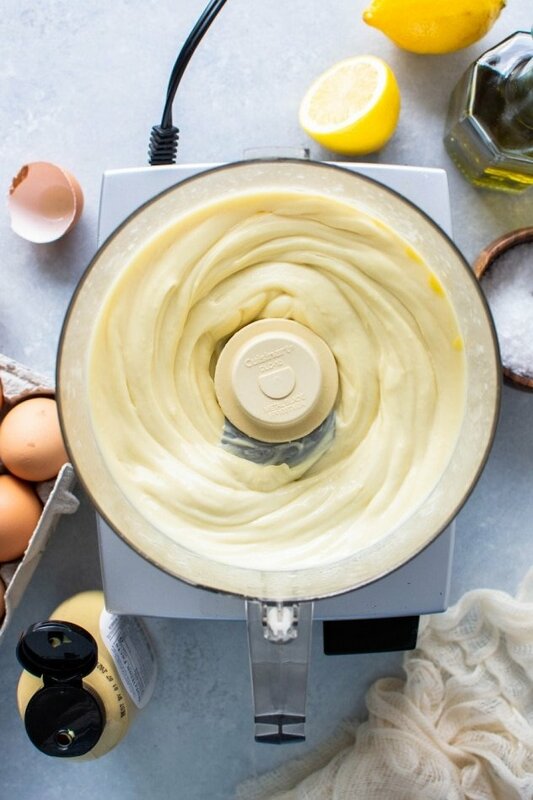 Once they’re cooked, all you need to do is add them to your food processor along with a healthy bit of ghee (or another fat of choice), some almond milk, a little lemon juice (trust me on this one! It adds just the right lift of flavor of these beauties), and salt and pepper. Then they get whipped until soft, fluffy and begging to have your fork plowed into them. The herbs are added last. You can either stir them in with a spoon or add them to the food processor or blender and quickly pulse to incorporate them. If you roast the parsnips it really is the only way that I’ve found to get the fluffiest result. Parsnips don’t yield in the same way that potatoes or sweet potatoes do, and thus a potato masher or kitchen aid won’t really do the job properly. 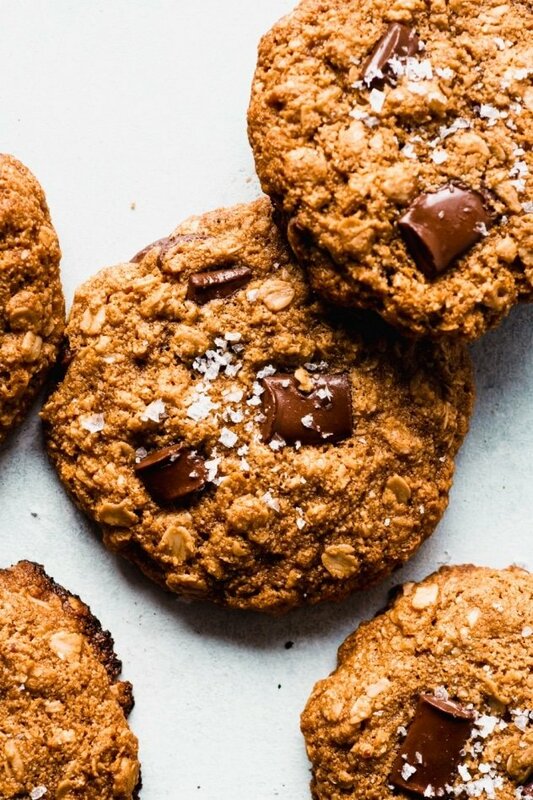 If you make these and pair them with something yummy in your kitchen I would love to see! Tag me on instagram @nyssas_kitchen so I can feature you! 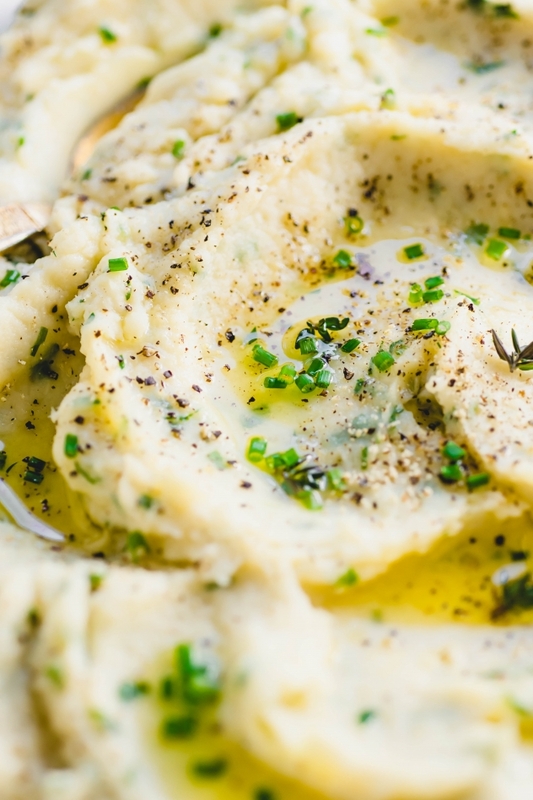 This whipped parsnip with fresh herbs recipe is a delicious alternative to mashed potatoes! A crave worthy seasonal side dish that is perfect for the holidays or a cozy comfort food meal at home. Paleo, gluten free and with a vegan option! On a large baking sheet toss cut parsnips and garlic cloves with 1 1/2 tablespoons avocado oil. Roast in the oven for 30-40 minutes, until tender and just barely starting to brown. Don’t let them brown too much or crunchy bits will form and won’t blend well into the parsnips. Alternatively, you can steam the parsnips and garlic until tender. This is a great option if your oven is already in use or if you don’t have a food processor or blender. If you plan to mash the parsnips by hand, see the notes in the blog post above. 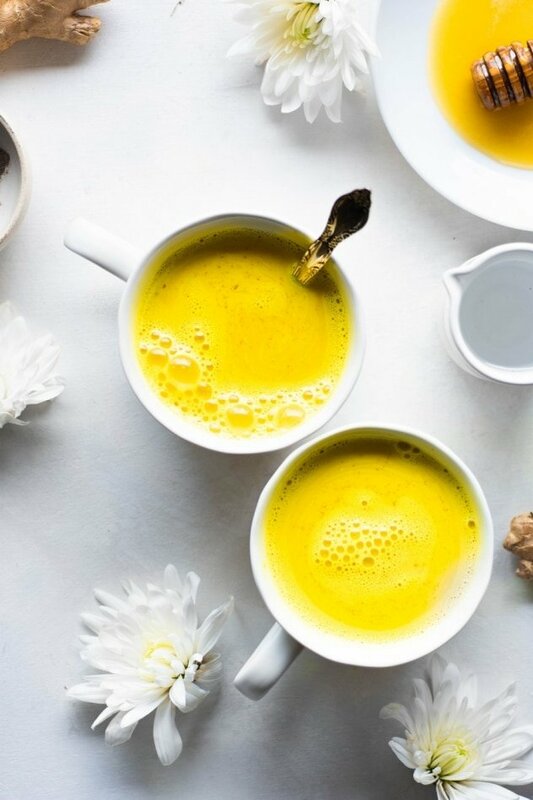 While waiting for parsnips to roast add all other ingredients except for the fresh herbs to your food processor or blender – 1/4 cup ghee, 1/4 cup almond milk, 1 teaspoon sea salt, 1/2 teaspoon black pepper, and 2 teaspoons lemon juice. Once parsnips are tender, remove them from the oven and add to the food processor with all the other ingredients. Process everything together until smooth and fluffy, with no pieces of parsnips remaining. Stop every so often to scrape down the sides if necessary. Add extra almond milk as needed to until desired consistency is reached. 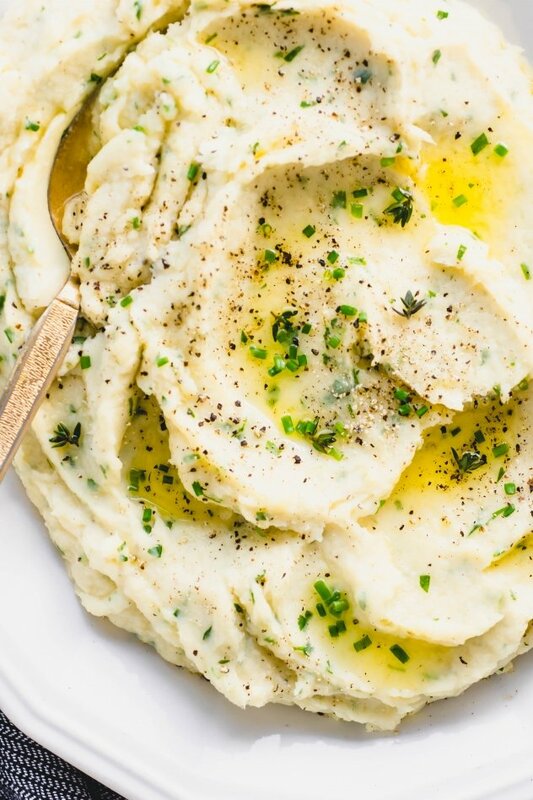 Once seasoned to your liking, add fresh herbs and quickly pulse to incorporate into the whipped parsnips or fold them in with a spoon. 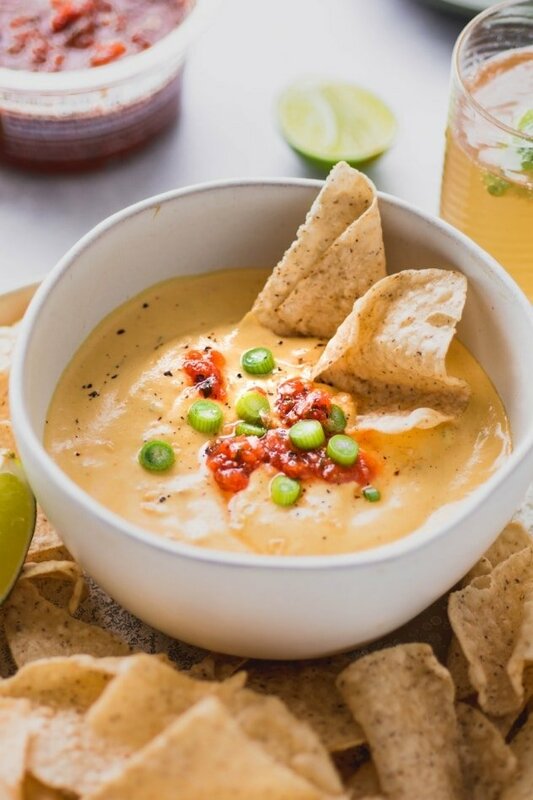 Serve immediately or store in the refrigerator to reheat later! 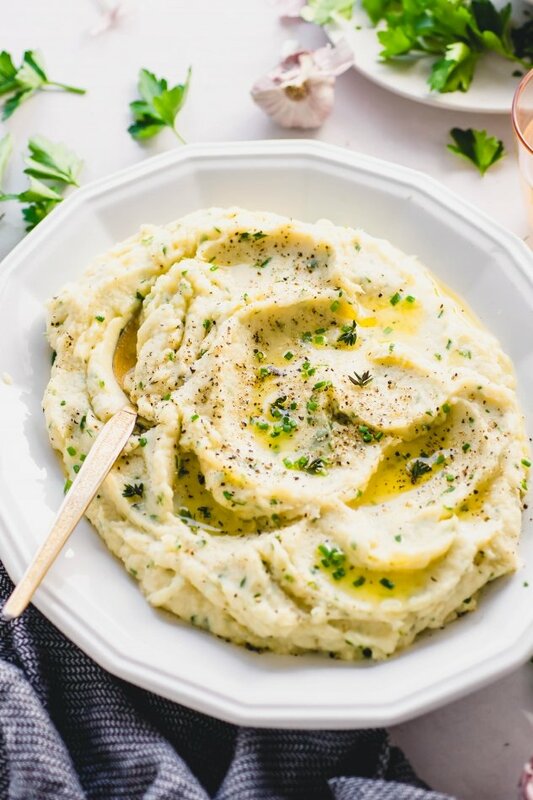 This entry was posted in side dishes and tagged dinner, easy, fresh herbs, gluten free, gulten free, holiday, low fodmap, paleo, parnips, side dish, thanksgiving, vegan, whole30 on November 10, 2018 by Nyssa Tanner.